My friend makes the best plum-cake ever. And my trials have never even come close. But that has never stopped me from trying again and again. Pretty soon, I figured out that if I was in mood for a piece of the traditional plum cake, all I had to do was just go three floors high to get the best cake ever! The deep dark color that is typical of a plum-cake is from caramel….And me and caramel? ho ho!! We have a long gap between us. Long long gap. In fact, me and caramel were not in talking terms for sometime. But with time, you learn to forget and forgive. I am trying to bridge the gap(as you will see tomorrow), but it is nowhere near perfection. I take it off the stove before it turns brown and my caramel ends up looking like condensed milk! You can see why I am upset about it, can’t you? Anyway, coming back to this cake…this was the last cake I baked before relocating to US. I had baked it for the virtual baby shower for Sapana. 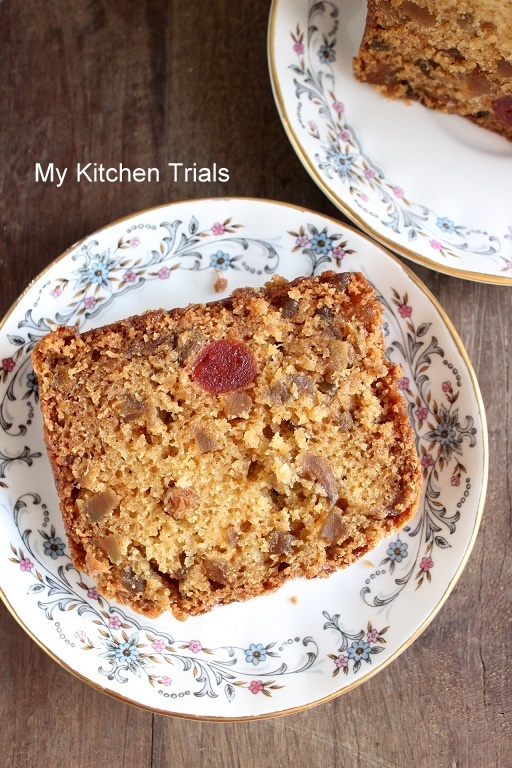 This is a good version of the fruit cake and pretty easy to put together. Her version didn’t have caramel, good for me! So, if you don’t have a friend to make the best cake for you and you are afraid of making the caramel, then this is a good recipe to try. Chop the fruits and nuts into bite sized pieces. Soak them in the juice and store in the fridge overnight. At the time of baking, preheat the oven to 180C/350F. Grease and line a loaf pan or an 8″ round pan with parchment paper. Sift together the flour and the spices with salt in a bowl. Keep aside. In a big bowl, beat the buttermilk (or yogurt) with the sugar until the sugar dissolves. Add the baking powder, baking soda and vinegar to this mix. Let it rest for 5 minutes or until it bubbles up well. Add the oil and the vanilla essence. Mix carefully until combined. Fold the flour mix into the wet ingredients carefully. Drain the dry fruit mix, toss in 2 tbsp flour until they are well coated (this will ensure that they don’t sink into the bottom of the cake). Carefully add this to the cake batter. Add the hot water, if needed, to incorporate this. Transfer the batter into the pan and bake for about 35-40 minutes or until a skewer comes free of crumbs when inserted in the middle of the cake. Let the cake cool before slicing and serving. This post goes to Blogging Marathon 51. 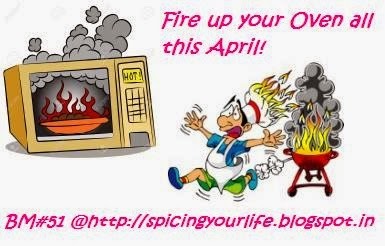 The whole of this month falls under the theme : Baking. amazing clicks yaar and the powdered sugar is very inviting and looks great. You had this recipe in your drafts for so long! I should also start enriching my drafts folder.. :) Cake looks scrumptious! Thats a sinful Fruit Cake Rajani. Pretty easy recipe, sure I should try this. Very nice pics as usual. I’m not friends with caramel either — it’s either burnt or not caramelized enough when I make it. So I avoid it as much as possible. This fruit cake looks delicious. 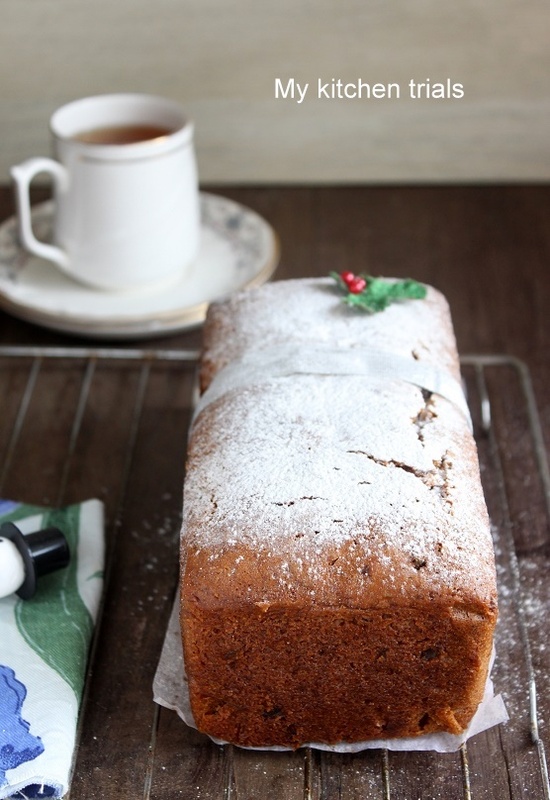 This eggless fruit cake looks yum. caramel or not ! love into dig into an egglss fruit cake anytime !! Not a friend of caramel either so I like this version. Love the picture with the uncut cake. Dont tortue me like this, if u send me a huge slice of this cake i’ll be the most happiest person in this world,tooo drooolwortthyyyy cake.. This is such a tasty bread loaf. wow!! !Your clicks are tempting me to bake this again. Lovely pics and a yummy fruity cake. The cake looks so good Rajani. The sugar dusting on top just elevated it to another level..
absolutely stunning cake rajani!! loaded with fruits,a very delicious bake it is!!! 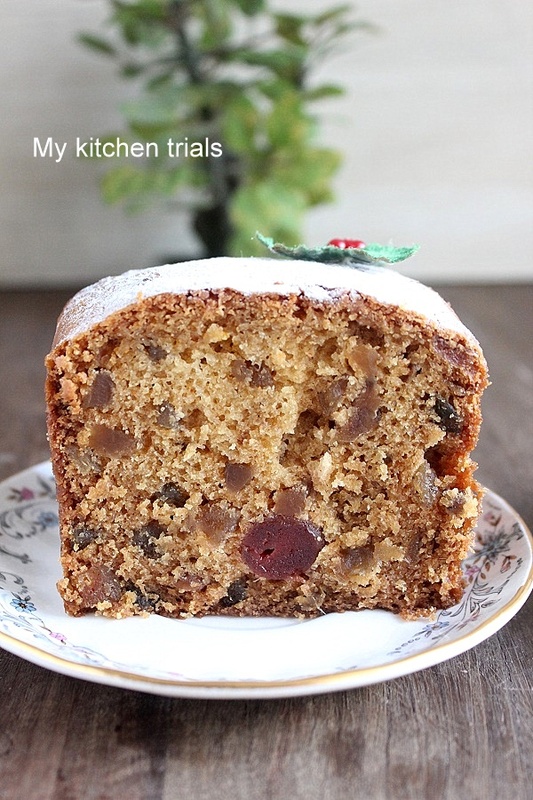 Love fruit cake with spices and this looks amazing! OMG I love Fruit cake. God I can’t wait for Christmas now… Supremely delicious.. If you say one more from the draft I am going search for ways to get to your drafts Rajani. This is a beautiful cake. Well this Christmas I plan to bake this for my friend.